Q: What kind of stories are you drawn to as a writer? A: I am drawn to stories with a lot of darkness in them, because I want to find out where the light shows up. Q: What inspired you to write The Sentinels of Andersonville? A: I saw a movie when I was a kid called The Andersonville Trial, directed by George C Scott. I was horrified to learn that donated food had been turned away and I wanted to find out why. Q: Do you have an interesting Civil War family history? A: No, but my husband does. Jack’s cousin, Jim, has a grandfather who, believe it or not, fought in the Civil War. Jim is around 60 years old and his father had him when he was around 70 years old and his father had him when he was around 70 years old. So, if you add it up, Jim was born around 1950, his father was born around 1880 and his grandfather was born around 1795. So, his three generations actually span 4 centuries! Q: What did you find most challenging about this story compared with your earlier books? A: To write accurately from a southern point of view, I needed to understand what independence meant to a southerner. Searching to understand that was critical to the story. 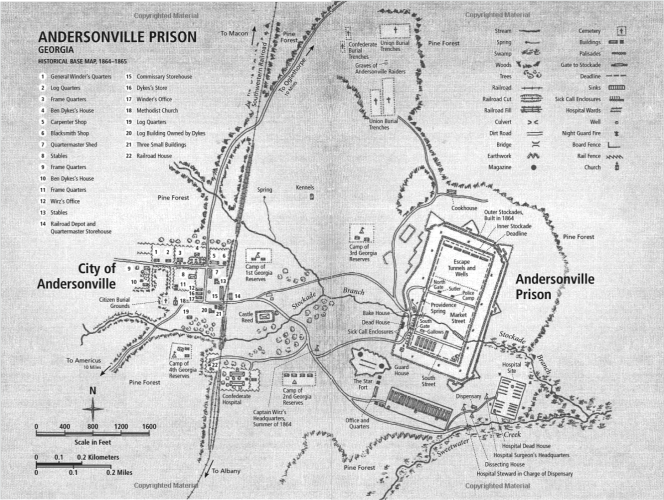 I was also challenged to get the details right for Andersonville prison, because this is a piece of our American history. Q: Which character do you most identify with? Why? A: I identified with so many, but in my heart I’d have to say Dance. Why? Because he was judging others for what they were not doing and I sometimes do the same. Q: I know research was an important component to making this story authentic and for my part, I found your recreation of the horror inside this overcrowded and disease-ridden place raw and haunting. What was most helpful to you in the research phase? Anything surprising or unexpected emerge? A: The most helpful were the original accounts of the prisoners through diaries, letters and writings featured in various historical documents. I wanted to go directly to the sources. I read through over 100 of these sources and the amazing thing is that these and many more are still out there. Several history books about Andersonville were also very informative, as were documentaries and film. A few unexpected things emerged. First, I wanted to hang Captain Wirz all over again when I initially embarked on my Andersonville research; when I finished my research I was surprised that he was no longer my target. I came into the project with ideas that changed as the research progressed. The culpability for Andersonville could not possibly fall on one man, although in my opinion General Winder should have faced the scaffold sooner than Wirz. Second, I began to understand and appreciate what independence meant at that time to a southerner. Third, I was amazed to discover that a neighbor of mine’s great-great-great grandfather had been a prisoner at Andersonville. We were on the subject of research for the book and when I told him what it was about, he told me about his grandfather. Later he came over with a transcript that had been published in an Indiana newspaper with his grandfather’s account. Q: A major theme of your story is the role of individual action – doing something, no matter how small, to help those in need can make a difference. Do you think that is a message that has relevance today? A: With all my heart. We have a shopping cart in our foyer at church where folks can put something in to help the needy through the Food Pantry. Every week I have an opportunity to put something in that cart to help someone out. Since writing Sentinels, I don’t miss that opportunity—and I no longer get annoyed if I think others are not giving or don’t care; I make sure that I am.